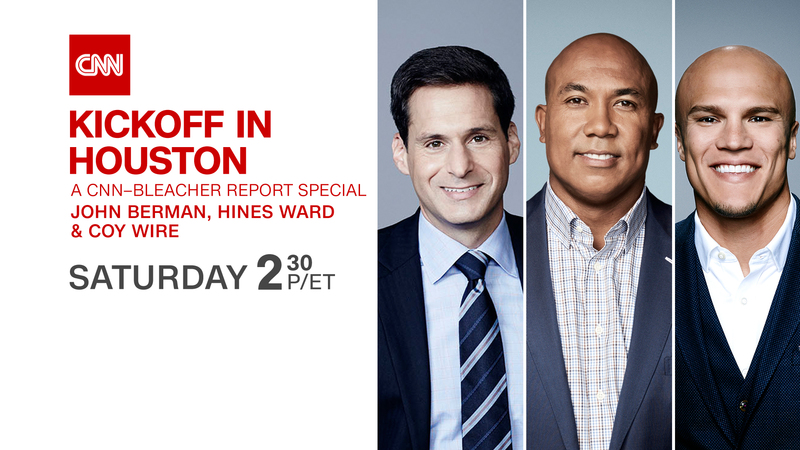 Leading up to Super Bowl LI, CNN will present a half-hour football special hosted by CNN’s John Berman along with two-time Super Bowl Champion and HLN sports contributor Hines Ward, former Atlanta Falcons Linebacker, CNN Sports Correspondent Coy Wire and Bleacher Report’s Lead NFL Writer Mike Freeman. Kickoff in Houston: A CNN-Bleacher Report Special will showcase the unique access CNN has had this past week as one of only three media outlets broadcasting from Super Bowl LIVE, the official NFL fan festival. Hines Ward, Super Bowl 40 MVP, and Coy Wire, former Atlanta Falcons team captain, will give viewers the secrets behind the success of the Patriots and Falcons. CNN Sports Correspondent Andy Scholes captures the passion that fuels Patriot Nation. Additionally, the special will feature predictions from Houston Texans’ defensive end J.J. Watt and an interview with Falcons Quarterback and leader of the high-powered offense Matt Ryan, where he discusses his mindset going into his first Super Bowl. “Kickoff in Houston: A CNN-Bleacher Report Special” airs Saturday, February 4th at 2:30PM/ET.